This will come in the end to GTL. Splintert is working on one. we just need some patience. A pic was posted on another website a long time ago. Car(s) are beta, but very good none-the-less. 330s, a 412 and a 365P car. Modder was criticized as never finishing anything, instead of encouraged and offered help. I would suggest looking back in the photos about 150-200 pages. If one of our awesome modders would pm the person, maybe they might even work with you. You never know what you'll get if you're nice. But it's just a beta and the car is very difficult to drive properly !!! Btw: I can't wait for both the testa and the 330p4 ! Good luck and thanks ! 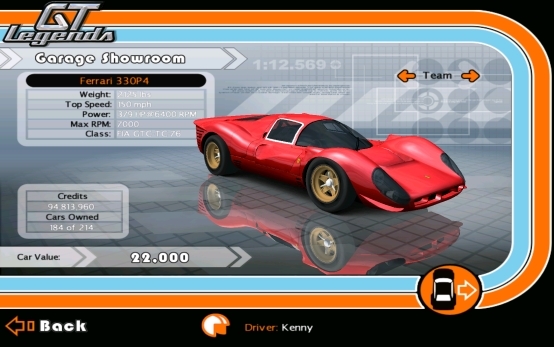 There are ontrack pictures at NoGrip of the Ferrari 330P, has this car been released ??? No, unfortunately all the cars beside the 250 GT California are still WIP ! I found these on the screen nogrip dedicated to Ferrari for 330/P4 GTLegend, does anyone know who the author and tell me if it is in anticipation of release? It's splintert92's mod ! We did some skins and some other little modifications, but still WIP ! Unfortunately this is not going to be released before DonPanoz's version ! The 330 P4 DonPanoz is doing has priority ! Any news on one of the most beautiful Ferraris ever? I worked on that car, but never blocked another guy who wants to work at the same. If he'll finish first, I see no problem. I really hope for a release in the near future because this car is, from my point of view, the most beautiful racing ferrari ever. :-) and I also think the forza model is many times better than the one made by TSF. It has been a while since there was any news about this car. Are there any updates? Was Donpanoz working on this? I thought I saw some postings from him about this car. It would be great to have this in GTL to run against the GT40's. Reproduce the great Ford/Ferrari battles of 66, 67 and 68. Then we need an updat eto the 67 LeMans track. I think he was but the forza model is much better but there are some issues with the release of that mod. Any news on this? Most needed! Apparently you're a long time not been here on the page. There are now a lot of great new mods.